Smokes and flashes win games, people. Last week we talked about how to best use HE grenades and firebombs. Knowing how to deal damage and control areas of the map is great, but before you can make use of that knowledge you need to know how to take control in the first place. That’s where smoke grenades and flashbangs come in. A flashbang that ‘pops’ as it enter a player’s field of vision is called a pop flash. The purpose of pop flashes is to give your opponent as small window to turn around as possible. Often you want to stand just behind a corner and call for a teammate to flash you in. By doing this you’ll either find your enemy completely flashed or with his back facing you if you time it right. There are also a few really good pop flashes that can be used without the help of a teammate. A lot of those flashes are used to take control over areas on the map. This flash on Cache is a basic one but really effective as you don’t have to turn around: you can just push. Another spot that can be hard to push without using at least one flashbang is short on Dust2. Aim at the slope right next to the stairs and run in a straight line as you throw it. If you succeed it doesn’t matter where they’re peeking from—they’re gonna think it’s Christmas. Play around on empty servers and try to find flashes like these two. Watching pro matches is probably one of the best ways to find new throws that you didn’t know about. HLTV.org is a great resource when it comes to pro demos. It takes 15 seconds from when a smoke grenade detonates until it has completely evaporated. Knowing this is key when you want to time plays or just want to delay your opponent’s attack. Let’s say you’re defending B on Dust2 and you’ve saved your smoke. They have 40 seconds left on the clock and your teammate on long just saw an enemy. You know the terrorists need four seconds on the clock to plant the bomb. In this scenario you have to make a decision. Do you hold on to the smoke for a few more seconds or do you use it? I’d say you should wait and see what happens. If it turns out the terrorist over on the other side of the map didn’t fake, you still have your smoke. If it on the other hand was a fake, it’s highly unlikely that the rest of their team will push at the exact same time. You can also use firebombs or flashbangs in order to delay the push even further. There are no right answers to these questions. Play the game and eventually you’ll find what works for you. Just make sure to pay attention to what usually happens when you do a certain thing and try to learn from it. Another thing that’s important when it comes to using grenades is that you don’t want to stand out in the open when you throw them. If you peek a spot and want to smoke off that spot you should always back off a bit before you throw it. Most of the times I’ve died with a grenade in my hand could’ve been avoided and it’s really frustrating when it happens. Try to stay focused when you practice. Sloppy play during practice will result in sloppy play in those games that really matter. After all, we are creatures of habit. The true beauty of Counter-Strike: Global Offensive is found in how well a team coordinates their plays. Watching teams like fnatic or SK Gaming execute their attacks is like standing before the Mona Lisa. 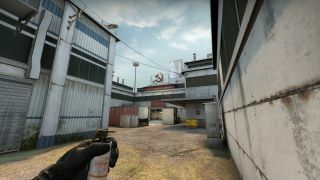 If you’ve played CS:GO in a team environment you know just how difficult it is to time your smokes and pop flashes perfectly with your teammates. Even if you’ve planned all the grenades you’re going to use you still need timing and move like a single organism to make the most out of your strategy. Na’Vi not only shows us the strategy as a whole, but you also get to see what each player does from their point of view. Watch and learn.